This oddball fungus is apparently pan-subtropical, found across the globe in areas with subtropical climates (in North America this includes the southeastern United States and parts of Mexico). 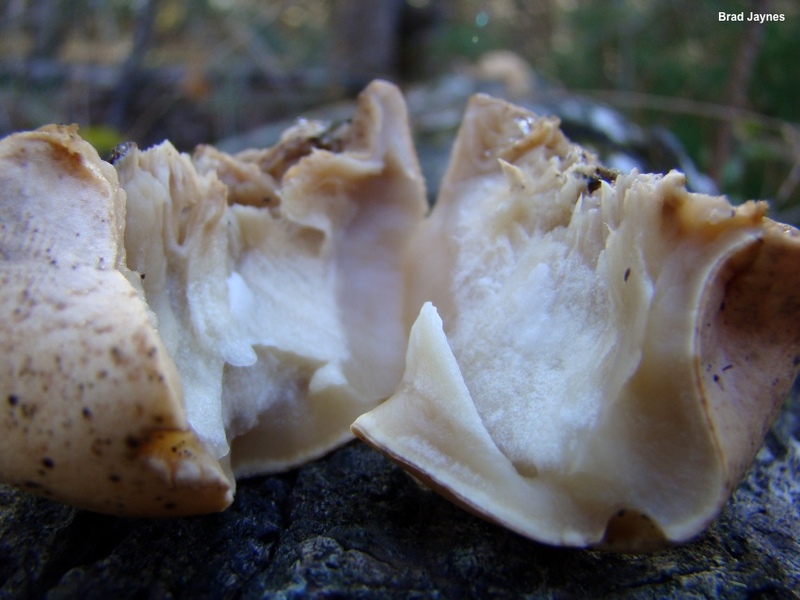 Trichoderma peltatum appears on the deadwood of hardwoods, and has the appearance of an "aborted" or malformed gilled mushroom, though it is not closely related to the gilled mushrooms at all. The upper surface appears smooth from a distance but, up close, is finely pimply. The undersurface is wrinkled into ridges and folds that approach being gill-like. There is no stem, and the flesh is whitish to pale tan. Trichoderma peltatum was known as Hypocrea peltata until recently. Thanks to Brad Jaynes for collecting, documenting, and preserving Trichoderma peltatum for study; his collection is deposited in The Herbarium of Michael Kuo. 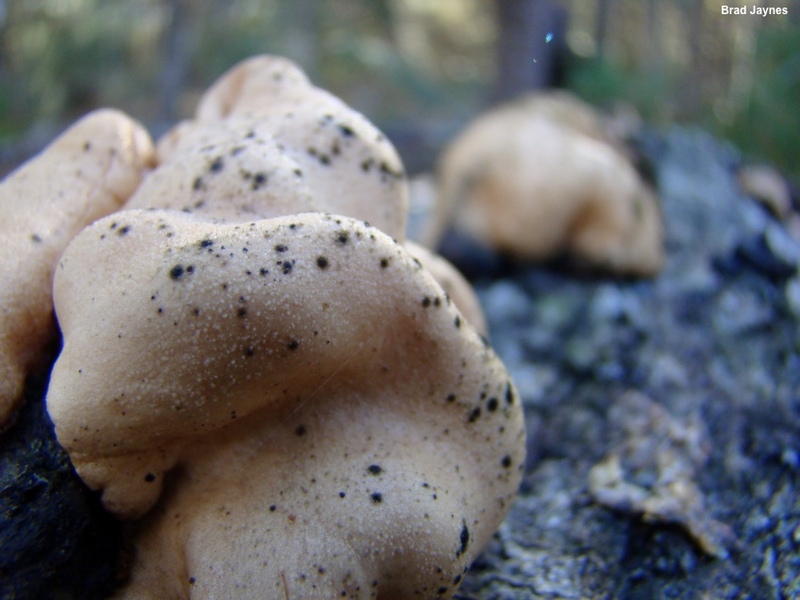 Ecology: Saprobic on the deadwood of oaks and other hardwoods (and occasionally reported on conifer wood); growing alone or gregariously; year-round; subtropical North America. The illustrated and described collection is from South Carolina. 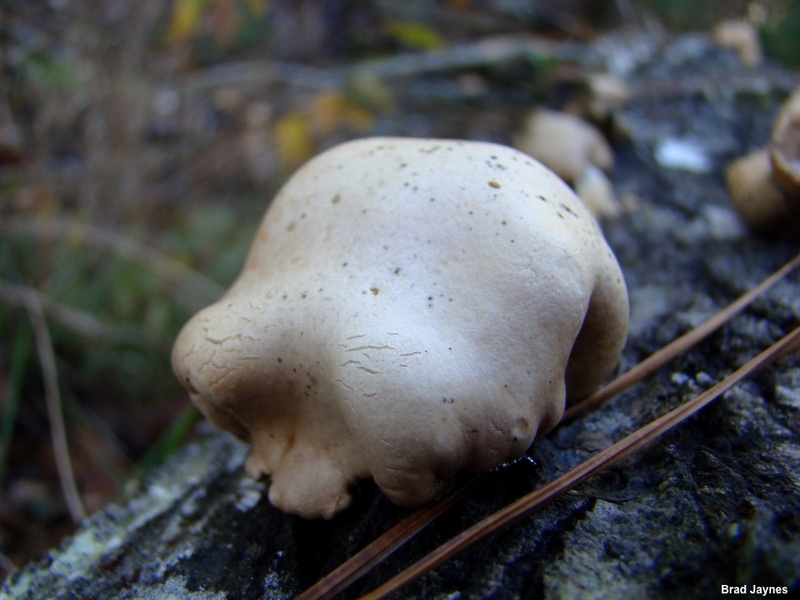 Fruiting Body: 2–5 cm wide; up to about 2 cm high; sub-circular or somewhat irregular in outline; more or less cushion-shaped, with an inrolled margin; upper surface pale tan, covered with minute, pimple-like dots; undersurface wrinkled, ridged, or nearly gill-like, pale tan to whitish; point of attachment more or less central; flesh whitish to pale tan. Chemical Reactions: KOH negative on dried specimens. 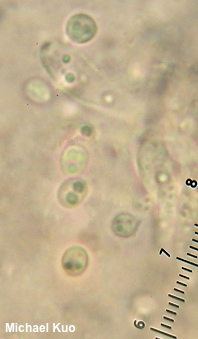 Microscopic Features: Spores dimorphic: either 4–6 x 3–4 µm, ellipsoid—or 2–4 µm, subglobose; smooth; often biguttulate; hyaline in KOH. 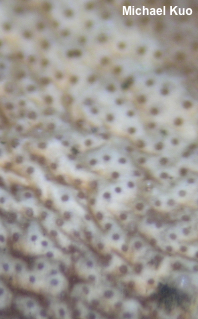 Perithecia 300–400 µm deep; subglobose to broadly ellipsoid. 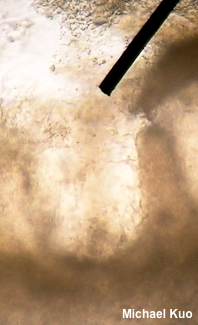 Asci 90–110 x 4–6 µm; cylindric; hyaline in KOH. REFERENCES: (Berkeley, 1851) Samuels, Jaklitsch & Voglmayr, 2014. (Samuels & Ismaiel, 2011; Jaklitsch & Voglmayr, 2013; Beug et al., 2014; Bissett et al., 2015; Elliott & Stephenson, 2018.) Herb. Kuo 12021701.